…from David Miles (Miles Better News Agency). 2019 is a big year for the French Citroën brand. 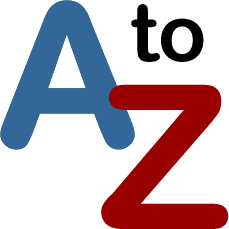 It’s their 100th anniversary and already the year has got off to a successful start with their products picking up several Car/Van of the Year Awards in the current round of annual ‘Oscars’ given by the motoring media. Also last weekend Citroën won the first round of the 2019 World Rally Championship – the famous Monte Carlo Rally, with their WRC C3 which also just happened to be the brand’s 100th WRC win. Now arrives their new C5 Aircross, a mid-sized five seater SUV. 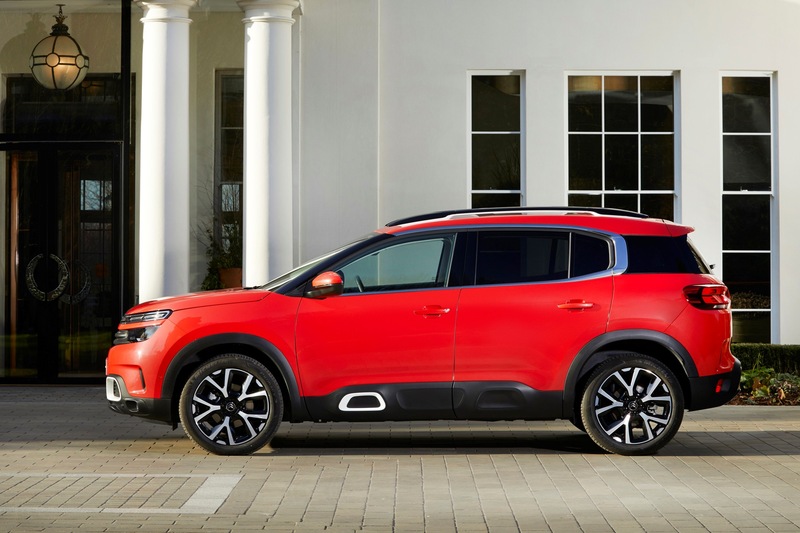 Citroën, part of the PSA Group of brands which now also include Peugeot, DS and more recently Vauxhall/Opel, already has the C3 Aircross compact SUV in their model line-up and that range achieved 9,919 UK sales last year in a very competitive market sector. The new C5 Aircross also faces already established stiff competition from such models as the best selling Nissan Qashqai, Ford Kuga, Kia Sportage, Peugeot 3008, Vauxhall Grandland X, Renault Kadjar, Hyundai Tucson, SEAT Ateca, Skoda Karoq, VW Tiguan and moving up to premium brands – the Audi Q3, BMW X1, and Volvo XC40. 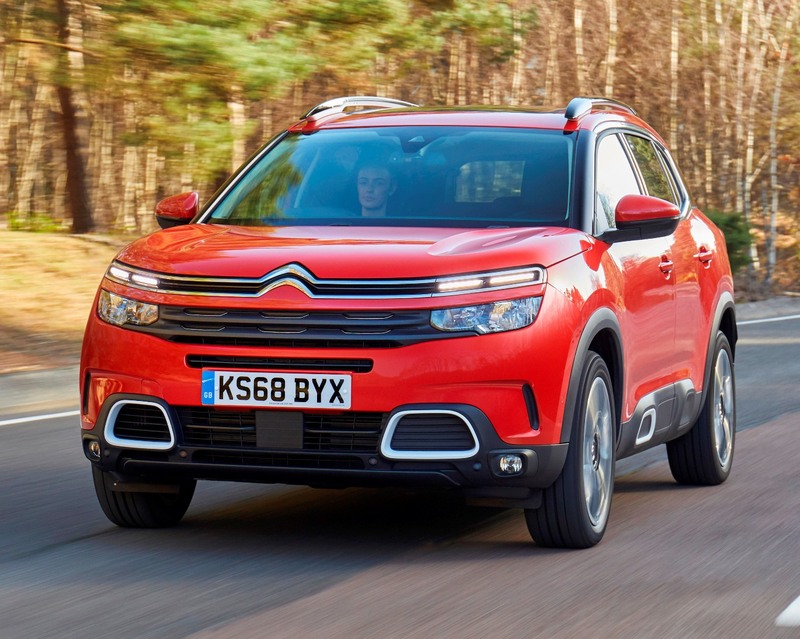 The C5 Aircross could continue Citroën’s 2019 winning ways because it has been named as one of the seven shortlisted models out of 38 new cars eligible for the 2019 Car of the Year title. The winner will be announced at this year’s Geneva Motor Show early in March. The Citroën C5 Aircross uses the same EMP2 platform and many of the same engines and other components as the award winning Peugeot 3008, DS7 Crossback and Vauxhall Grandland X. Unique to Citroën however is the use of their recently introduced Advance Comfort programme, including the seating and the cushioned suspension system. Adding something new to the SUV sector, it utilises the versatile seating layout and multiple storage compartments normally found with MPV ‘people carrier’ models. The C5 Aircross prices range from £23,225 to £32,725 and they go on sale in the UK this coming Monday 4th February. There is a choice of three specification and equipment levels – Feel, Flair and Flair Plus and numerous personalisation options, bodywork and interior colour choices plus technology packs. The EU 6.2 compliant engine choices, all with Stop/Start function, are all well-known within the PSA Group of multiple brands. These are the petrol 1.2 PureTech 130 hp six speed manual and 1.6 PureTech 180 hp eight speed auto. Diesel options are 1.5 BlueHDi 130 hp six speed manual/eight speed auto and 2.0 BlueHDi 180 hp auto. Grip Control with Descent Control for added front wheel drive traction and grippier tyres is an option starting from £400, depending upon the size of wheels. It is only available for some auto transmission models and around 5% of buyers are expected to take up this option. A PHEV plug-in hybrid model will become available early in 2020. 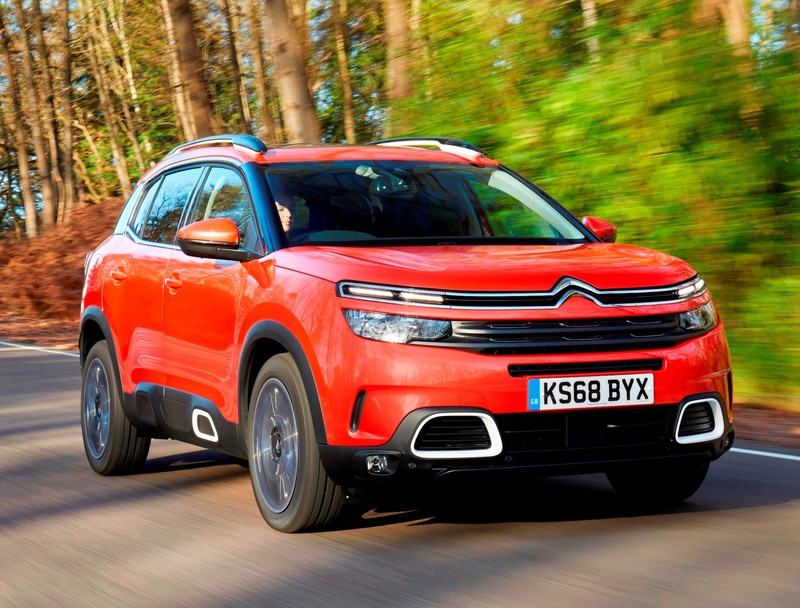 Citroën UK said at this week’s media launch that they are looking at a 50/50 sales split between petrol and diesel engine choices, 64% of customers will select a manual gearbox model and retail buyers will account for around 52% of registrations. When it comes to engine choices, BlueHDi 130 models will account for 48% of UK sales, PureTech 130 31%, PureTech 180 19% and BlueHDi 180 2%. As for spec choices Citroen expects Flair to take 52% of sales, Flair Plus 38% and Feel 10%. Citroën UK however were not so forthcoming with overall sales predictions, saying it was commercially sensitive. Not surprising there are no sales forecasts given the decline in new cars sales caused by the financial downturn in global markets, the demonisation of diesel and issues re Brexit in the UK. However they did add that the best-selling single version will be the Flair BlueHDi 130 six speed manual priced at £26,825. 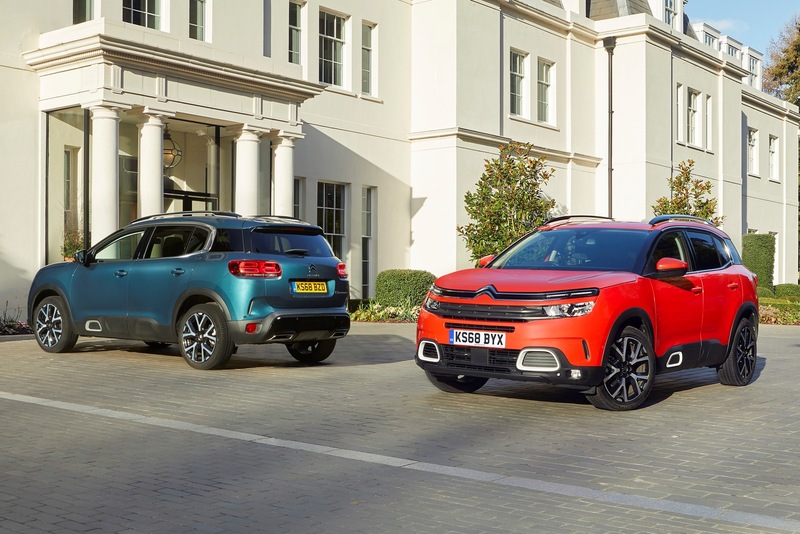 With so many mid-sized SUVs already available for sales Citroën said they expected 45% of C5 Aircross UK sales to go to current SUV owners, 7% to go to current MPV users and the remainder to hatchback and saloon customers. Joining the popular, some would say over-crowded, SUV market at such a late date is never going to be easy. 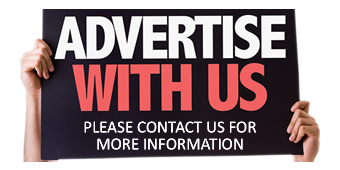 All angles such as styling, size, specification, engine types, capabilities and price ranges are seemingly covered. But Citroën as a brand is renowned for their quirkiness so it might still find a way by offering SUV styling but coupled with MPV seating and load carrying versatility plus of course their new ‘Comfort’ features. Citroën did just that with the C3 Aircross in the compact SUV sector, and this model has sold well despite the competition. Exterior styling wise the new five door Citroën C5 Aircross SUV utilises the brand’s latest bold face design, high bonnet line and sleek lighting units. 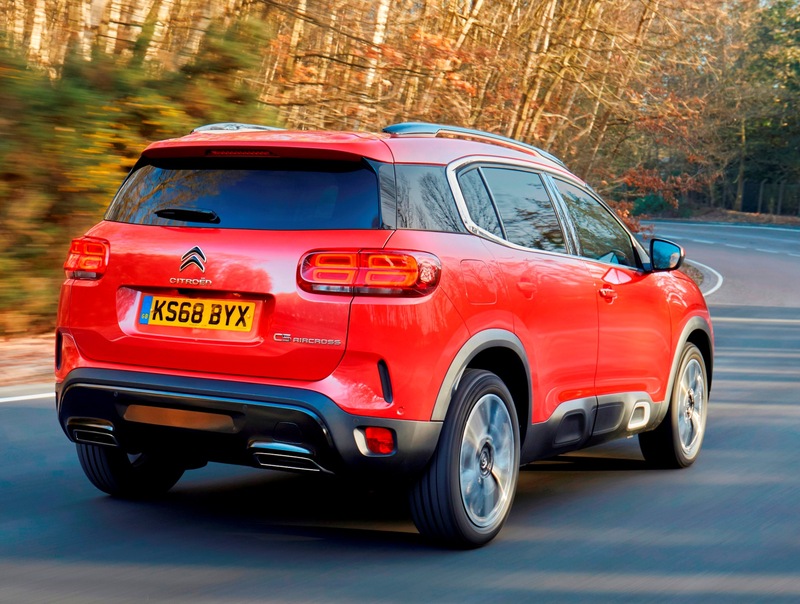 There is the usual SUV rising waistline side profile but the slab-sided body panels are given a lift by the addition of Citroën’s signature Airbump protective lower door panels. Personalisation options might also play a major role in differentiating the C5 Aircross from its many competitors. There are a total of 30 exterior colour combinations for the bodywork with a choice of wheel sizes, and the usual roof bars add to its dynamic styling but these are not new in this sector. Inside the personalisation choices continue with a variety of colour combinations and trim and material choices, it’s just a matter of detail and choice. The quality seems competitive although it sets no new standards and here are some areas, like the door cards that are less impressive for quality. Comfort is a high priority feature with Flair and Fair Plus versions having Citroën’s Advanced Comfort seating. The three individual sliding, folding and reclining rear seats bring an element of MPV versatility to this SUV. The load space ranges from 580 to 720 litres (20.48 to 25.43 cu.ft) with the rear seats in use and up to 1,630 litres (57.56 cu.ft) with the seats folded down. There is a large panoramic opening sunroof measuring 1,120 mm (44.09 in) by 840 mm (33.07 cu.ft) available as an option on Flair versions and standard for Flair Plus versions. Under the skin the vehicle uses the brand’s new suspension system with Progressive Hydraulic Cushions for the bump stops. Each suspension strut has a hydraulic cushion pad top and bottom. During the compression and decompression strokes of the damper unit these pads help iron-out all but the worst of impacts from deep potholes and generally provide compliant and well-controlled ride comfort. However with the soft riding suspension units there is a limited amount of cornering bodyroll evident – but it’s not enough to upset the vehicle’s handling or passengers’ stomachs. Standard on all versions is a central 8-inch touchscreen used to control the vehicle’s primary functions. Unfortunately like most PSA Group models, and other manufacturers’ touchscreen functions, this means that the most-used tasks such as adjusting the heating, ventilation, air-con, radio settings and more, all have to be done via the screen which is not user-friendly, convenient or – potentially – safe. A 12.3-inch customable TFT instrument display, active cruise control, auto dual zone air-con, rear parking sensors, Advanced Active Safety Brake, Active Lane Departure Warning, Active Blind Spot Monitoring and Collision Risk Warning are standard. Highway Driver Assist, which is a level-two autonomous driving system, Extended Traffic Sign Recognition and Speed Recommendation plus Intelligent Beam Headlights are standard on Flair Plus versions. An180-degree colour Reversing Camera with Top Rear Vision is standard for Flair and Flair Plus versions. Citroën Connect Nav with TomTom Live updates for Flair and Flair Plus spec levels, Citroën Connect Box emergency & assistance system is standard for all as is Mirror Screen function, compatible with Android Auto, Apple CarPlay and MirrorLink. Wireless Smartphone Charging is optional on Flair and standard on Flair Plus versions and ConnectedCAM (dash camera) is a £200 option on Feel models but standard on Flair and Flair Plus versions. All those spec items and availability take some digesting but easier to get to grips with are the driveability and performance functions. The platform we know well from other PSA Group mid-sized SUVs and the engines and gearboxes we also know from their use in a wide range of models from hatchbacks, estates, MPVs and SUVs. There isn’t much to add, they are generally very fuel-efficient, have very competitive low CO2 emissions, fulfill a wide range of driving requirements and are competitive for prices. The C5 Aircross main attraction for many customers will be its better than average ride comfort with the brand’s use of comfort seats and their comfort suspension systems. Add in versatile MPV seating, the quirky styling tweaks and these features could be enough to tip the scales in favour of this range over the very similar award winning Peugeot 3008 and Vauxhall Grandland X. I rather suspect the deciding factor might be brand loyalty, the convenience of the nearest suitable dealer and finally the price and deal on offer. Just for the record I drove at this week’s media launch the expected best-selling version, the C5 Aircross Flair, 1.5 litre Blue HDi 130 hp turbodiesel with its six speed manual gearbox. With 300 Nm (221 lb.ft) of torque available from 1,750 rpm this unit is responsive providing full use is made of the gearbox, keeping the unit in its optimum power delivery band. Top speed is 117 mph and the zero to 62 mph acceleration time is 10.4 seconds, very much in keeping with other PSA Group models which use this EU 6.2 compliant engine. Potentially it is fuel-efficient with the new WLTP Combined Cycle figure of 55.1 mpg. On our traffic busy test driving route around the affluent areas of Berkshire and Surrey, despite lots of stop-start conditions, the real-life figure was 54.2 mpg. With more high speed motorway cruising I’d still expect this model to return around the 50 mpg mark. Most noticeable of all was the vehicle’s excellent ride comfort, even over badly damaged road surfaces, and its neat handling. It’s perhaps the small differences such as comfort and versatile seating combinations that will add up to a larger reason to buy the new C5 Aircross over longer serving and well established competitor models. For: Ride comfort, seat comfort, wide range of engine choices, specification levels and personalisation options, roomy with versatile three rear individual seats, combines SUV exterior styling with MPV interior versatility. Against: Some body roll during cornering, too many functions have to be operated via the touchscreen, cheap feeling plastic trim around the door cards, ungenerous warranty. Citroën C5 Aircross Flair, BlueHDi 130, six speed manual (best selling model). Engine/transmission: 1.5 litre, four cylinder, BlueHDi turbodiesel 130 hp, 300 Nm (221 lb.ft) of torque from 1,750 rpm, six speed manual, 2WD with Stop/Start. Performance: 117 mph, 0–62 mph 11.8 seconds. Fuel consumption: Combined Cycle 55.1 mpg (54.2 mpg on test), CO2 108 g/km, VED diesel rate First Year road tax £165, Standard rate £140, BiK company car tax 26%. Dimensions/capacities: L 4,500 mm (14.76 ft), W 1,859 mm (6.10 ft), H 1,670 mm (5.48 ft), boot/load space 580 – 1,630 litres (20.48 – 57.56 cu.ft), braked towing weight 1,450 kg (3,197 lb), five doors/five seats.